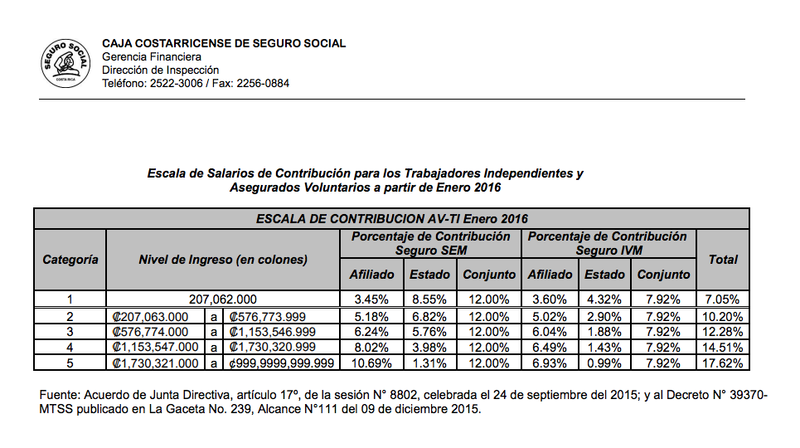 What is the health insurance payment scale used by the Costa Rican Caja system to establish the monthly public health care premium? The Costa Rica public health care system is administered by the Caja Costarricense de Seguro Social (CCSS) known locally as the “CAJA”. The law requires every worker in Costa Rica to be covered by the public health care system. Employees are covered by their employer and those that are self employed must pay into the system under the independent worker coverage known as “asegurado voluntario”. What about foreign residents in Costa Rica ? Costa Rican law also requires foreign residents that have been approved for legal residency in Costa Rica to pay into the public health care system as part of the condition to obtain and preserve their legal residency status in the country. As such if you are applying for legal residency in Costa Rica before you are granted the residency card you must show proof that you have registered and are current in your payments to the public health care system. To renew your residency status you will also have to show proof that you are up to date with all health care coverage payments to the Caja. 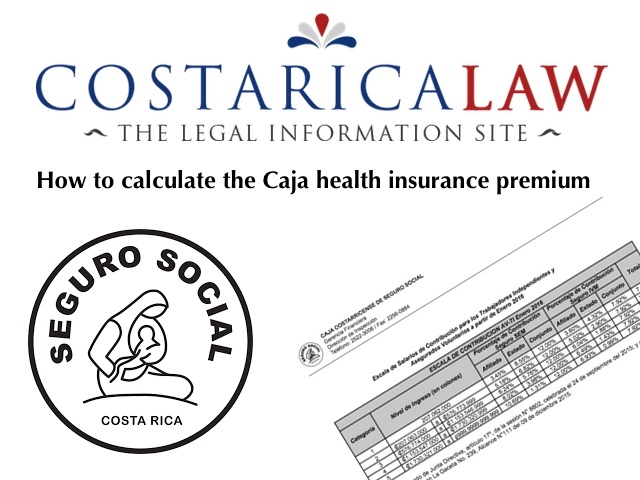 These calculations will be done using the health insurance payment scale of the Caja. What are the amounts that must be paid ? The type of insurance that is required for residency purposes would be the insurance called “asegurado voluntario” which means you are insuring yourself as opposed to having an employer provide the health coverage. The amount that will be used as the basis for monthly premium for coverage is based on a percentage of the income that you have reported when you applied for residency. As part of the process the applicant will be required to undergo a short interview with the Caja case officer to determine amount you will be required to pay. Each regional CAJA office has their own process to carry out the interview so much of this will depend on the particular Caja office for your location. The place where you live will determine the regional Caja office where you must apply. I have seen a lot of variations in procedures and methods used by local offices in the manner in which they go about establishing the income level threshold which then becomes the basis for the monthly premium. The starting point will always be the information that you provided in your immigration application as income. Once that income amount is established then the following sliding scale will apply to that income to determine the monthly premium payment. Foreign residents are only required to pay into the health care portion (SEM) and not into the pension system (IVM) as such the information below relates to the health care premium payment. 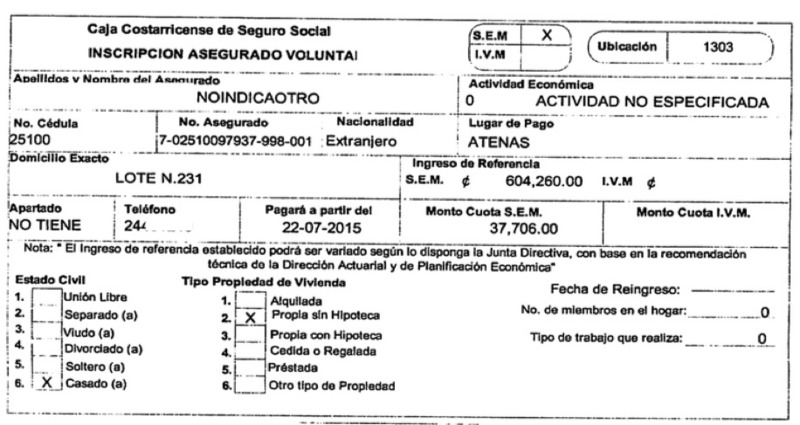 The following is an example of the registration form provided to a foreign residency holder, Pensionado status issued by the Caja office in Atenas. In that example the pension amount that was the basis for the calculation was 604,260 Colones (US$1,060) and the amount of monthly premium that was applied was 6.24% for a monthly payment of 37,706 Colones per month (approx $67 per month). Q&A: Join the Caja in Costa Rica-How, When, and How Much?